In case you haven't heard, there's a new trend in client gifting...the Pop-up Shop! Who doesn't love shopping? Our pop-up shopping experiences create dialog between guests, provide an activity for everyone to enjoy, and give each client a choice of a gift that they will actually use. Most recently we created a pop-up Maui Jim Sunglass shopping experience at an event at the Borgata in Atlantic City. Our clients hosted 250 of their top advertisers with live music, talent meet and greet, custom crafted cocktails and a plethora of food offerings. 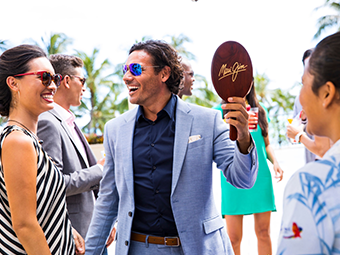 Our Maui Jim gifting experience took the event to the next level. While guests enjoyed mingling in our Maui Jim booth, they had the opportunity to try on and model 25 different styles of sunglasses. Ultimately, each guest selected their perfect pair and walked away with their choice of polarized, top quality shades. To top it off, we had custom printed cleaning cloths and cases with the client logo to brand the experience. Want to add a pop-up shopping experience to your next event? Call me!